VANCOUVER, JAN. 29, 2019 - Peter Guarasci, a prominent alumnus of Team Canada's Men's National Team, has been named the first-ever Head Coach and General Manager of the Fraser Valley Bandits of the Canadian Elite Basketball League (CEBL). Guarasci's decorated basketball lineage spans the globe, beginning as a player at the highest levels of American and Canadian collegiate basketball. This paved the way for an impressive 12-year professional career in top men's leagues in Germany, Spain, and Italy, highlighted by a key role on Canada's Men's National Team under now Charlotte Hornets Lead Assistant Coach Jay Triano, and alongside fellow national team alumni and two-time NBA MVP Steve Nash, current Assistant General Manager and Executive Vice President of Canada's Senior Men's Program Rowan Barrett, and NBA TV Canada Analyst Sherman Hamilton. 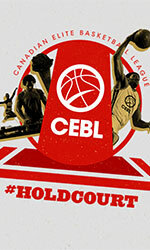 The CEBL begins play in 2019 in six cities across Canada. Fraser Valley's first-ever game is scheduled for Thursday, May 9 when Guelph visits the Bandits at Abbotsford Centre for the team's inaugural home opener. The announcement of Guarasci's appointment was made at a press conference in downtown Vancouver at the Shark Club Sports Bar & Grill. Guarasci represented Canada on the international stage at the 1995 Summer Universiade in Fukuoka, Japan, the 1998 International Basketball Federation (FIBA) World Championship in Greece and the 2000 Summer Olympics in Sydney, Australia. Standing 6-foot-9, Guarasci built a reputation as an elite defender at every level. He finished top 10 in blocks in the Metro Atlantic Athletic Conference in 1992-1993 and 1993-1994 while playing for the Fairfield Stags men's basketball team in NCAA Division I. After two years in the NCAA, Guarasci returned to Canada where he played two seasons at Simon Fraser University (SFU) in the National Association of Intercollegiate Athletics (NAIA), earning two team MVP awards and a nod as an NAIA All-American in 1996. Guarasci has dedicated himself to coaching since retiring from professional play. Between 2012-2018, he served as the head coach of the University of British Columbia Okanagan's men's basketball team, where he placed an emphasis on student-athlete achievement, both on the court and in the classroom. 'I would like to thank Bandits President Lee Genier, CEBL Director of Basketball Operations Joe Raso, and the rest of the Canadian Elite Basketball League's stakeholders for this tremendous opportunity. I am very excited to be part of a league with a mandate to develop the game domestically and provide a podium for Canada's most exciting generation of professional basketball players,' Guarasci said. Towards the end of his professional playing career, Guarasci spent summers with the Canadian Development and Junior National men's teams in 2005, 2006, 2008 and 2009, where he used his skillset as one of Canada's best centers in the late 1990s and early 2000s to help develop the next generation of Canadian post players. This paved the way for valuable stints as an assistant coach at SFU and the University of Alberta before ultimately serving as a head coach at MacEwan University and then with the University of British Columbia Okanagan's men's basketball team for six years. While coaching the Heat, Guarasci utilized a holistic approach towards fostering student-athlete development at the university and in the community. Beyond coaching and recruiting, Guarasci was actively involved in academic monitoring, university fundraising efforts, and youth-driven development programs, evidenced by his development of one of the Okanagan's top-tier youth basketball programs, the Junior Heat. Guarasci currently resides in Kelowna, where he coaches with the Fundamental Youth Basketball Association (FYBA). 'Basketball is the sport of Canada's current cultural moment, and I couldn't be more excited to forge a bold new chapter in Canadian basketball history by welcoming a Head Coach and General Manager of Guarasci's calibre,' said Genier, who spent 19 years with the Calgary Stampeders, where he held the position of Senior Vice President of Business Operations prior to winning 2016 NLL Executive of the Year with the Saskatchewan Rush.